Lord Shiva and Goddess Girija can be appeased with simple but dedicated offer of worship and Sevas. 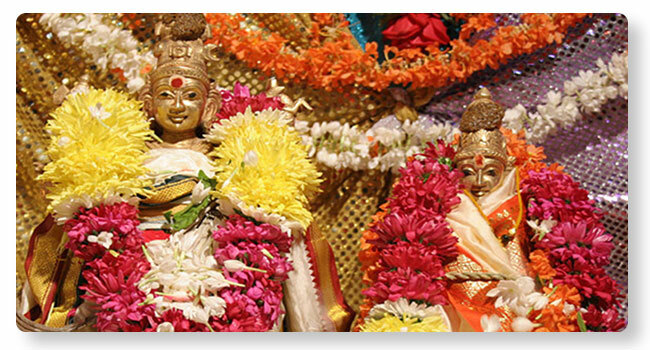 Girija Kalyana is one of the most meritorious Sevas to please Lord Shiva. Men and women seeking a prospective match for wedding, couples suffering from troubled relationship and childless couples can offer Girija Kalyana Seva to Lord Shiva and Goddess Girija. Cancellations, Refund Policy & Adherence •	Cancellation of a puja or service can be made within 3 days before the actual puja date and only Advance or Partial refund will be given based on the purpose of cancellation. There will be no refunds for cancellations made within 3 days of the event •	The puja charges will not be refunded under any circumstances, however due to un foreseen and exceptional circumstance puja date can be rescheduled only after consultation with the Kshetra or Temple and availability of purohit. •	Devotees booking the Puja should strictly adhere to traditions and regulations of the Kshetra or as guided by Purohit or as guided by Spiritual Products Private Limited support centre. Payment Policy •	Registration for Puja / Service is not complete until payment is received in full. •	If full Payments are not received with in seven business days before the Pooja in case of advance payment, may result in non-delivery of service. •	Payment may be made by the payment options available on our website or as instructed by our support centre •	Full payment for Puja / Service may not include small dakshina given at the time of puja or service Contact Us •	Please note that our Support Team (support@pureprayer.com) and help line (080) 67666666 is ready to provide you with timely assistance during our business hours. •	It may take anywhere between 12-24 hours for our Support Team to respond to your queries. •	We promise to resolve all your queries with the right solutions in a timely manner.